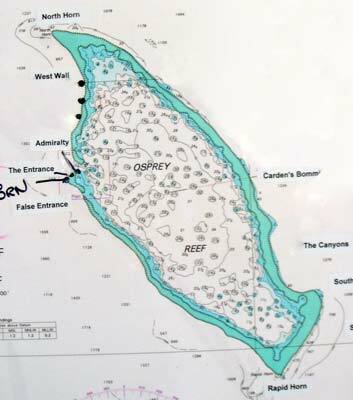 This is not actually a dive site as the photos could be taken anywhere at Osprey Reef. What happens is that the neight before, the crew of the Undersea Explorer drop a number of traps down about 300 metres right on the edge of the reef. The traps are collected the next morning. When this was done on our trip, 38 nautilus were caught. During the day, the biologists on the boat measure them, taking certain records while explaining them to the divers on the boat. 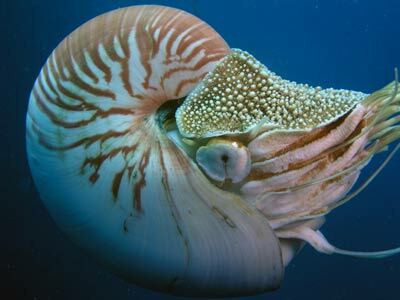 The nautilus are engraved with a number (for identification purposes and to make them worthless for poachers). Of the 38, two or three had been caught before. In the afternoon, an opportunity is given to photograph the nautilus before they are released. This is at the end of a dive when you return to the boat. Opportunites are also given at the start of the night dive. 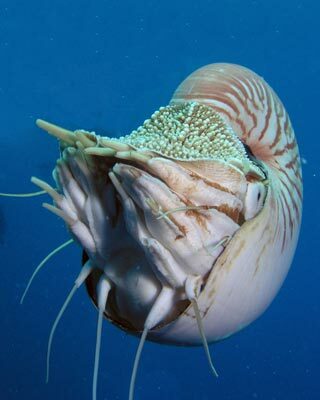 What happens is that your buddy "heards" the nautilus while you take photographs. You need to stop it sinking away to the depths. It is not too hard to get photos, but the little buggers like swimming in circles as they drop. A very unique opportunity to get photographs of these beautiful deep sea creatures.